Home » faith , Favor , Obedience , Prayer , Trust » Following Jesus! I have spent a lot of time lately reviewing the teachings of Jesus concerning following Him and what it really means. I have always taught that to follow Christ meant to listen, wait, use discernment, and then always say Yes when called - no matter the purpose. 57 Now it happened as they journeyed on the road, that someone said to Him, "Lord, I will follow You wherever You go." 58 And Jesus said to him, "Foxes have holes and birds of the air have nests, but the Son of Man has nowhere to lay His head." 59 Then He said to another, "Follow Me." But he said, "Lord, let me first go and bury my father." 60 Jesus said to him, "Let the dead bury their own dead, but you go and preach the kingdom of God." 61 And another also said, "Lord, I will follow You, but let me first go and bid them farewell who are at my house." In this simple passage it is easy to feel the Lord is too rigid and demanding, but the fact is, He is teaching us a principle that many overlook because of our bent to take care of ourselves first rather than see His work as most important. You see, my friend the principle is very simple, to be a Christian that experiences all that God desires to bring into your life requires obedience and devotion--and that takes passion. I have often said that we like to treat God as some sort of Genie in a bottle. We rub the throne a little with our requests and hope He will pop up and answer. But God is no Genie! So it doesn't surprise me, if He is looked at as such, that your prayers go unanswered. The principle Christ is teaching is that He needs you to say "Yes" to His call. Not "maybe" or "I will think about it," but simply "Yes Lord, I hear you. I will go." Like Isaiah the prophet we need to say, "Here I am Lord, send me," Is. 6:8. Does this mean as a Christian you are destined for the mission fields? Yes, it does! How rewarding and honoring to us that God would see fit to use us to do His work! That mission field may simply be your back yard, your neighborhood, your city, or the world. But what ever it is, to receive God's unheralded blessings we must begin to cultivate a deeper, richer relationship to Him. Not doing so will result in a stagnate everyday walk. That is not His desire for His children. I like to use the word believer when talking about God’s children, as it specifically refers to those who have trusted Jesus Christ as Savior. That is a much smaller population than those who label themselves Christian. But did you know that even fewer people could rightly be called “followers”? These are the folks who passionately pursue the Lord’s will in all things. Are you a believer or a follower? Trusting in Jesus Christ is fundamental, but doing so is the first step, not the culmination, of a person’s faith. Our primary purpose is to take a life-long journey following in the Lord’s footsteps, honoring Him with our actions and speech, and always increasing in biblical wisdom. 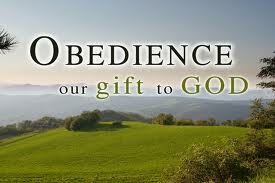 A follower’s life is summed up in the phrase complete obedience. In fact, Jesus defined true Christians as those who prove their love for Him by keeping His word (John 14:23). When it comes to obeying God, there are really only two responses—“I will” or “I won’t.” It’s tempting to say, “I will, but . . .” as some of Jesus’ would-be disciples did, but that’s a roundabout way of saying no (Luke 9:59). Followers remain faithful to the Lord’s plan whether doing so is easy or hard. Not only that, but they proclaim Him in both blessing and calamity, and go even when they don’t like where He leads. Followers pursue the Lord because they know that the reward is a deeper, more passionate relationship with Him. They are not just waiting to spend eternity with God in heaven. They realize that eternity begins now, as they accompany Him on the righteous path He has set before them. May the Lord open your eyes to hear Him and give you the courage to trust Him this day!